Friday was my last day of work. So to celebrate this fact I went out for lunch with a friend from work to a restaurant called Rebo in the Sky City complex. The food was AMAZING. It was so good that I will have to go back there for every special occasion there is. The food was presented beautifully and everything, including the bread, was an absolute taste sensation. 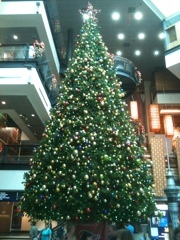 Today’s photo is of the Sky City Christmas tree which was my fabulous view from where I was sitting in Rebo. It’s one of the most amazing trees I’ve seen this Christmas.